Surface Water Pathways – wastewater and stormwater discharge during manufacturing releases PCBs to the whims of nature. Airborne Pathways – PCBs have been detected in the atmosphere of the Hudson River basin in New York and on vegetation due to atmospheric fallout . Food Chain Pathways – Bioaccumulation – PCBs are stored in fatty tissue of the food chain. Recent studies among fishing communities around the similarly polluted Great Lakes in southern Canada and the northern US suggest that the PCBs there are damaging children's neurological development - causing slow learning, poor memory and short attention span. In fish, dioxin exposure of eggs effects embryo development causing reduced hatchability and increased mortality during the -- sac fry -- stage. Laboratory experiments have shown high levels of PCDD/Fs in inland waters would cause early life stage mortality in feral fish, thereby reducing fish populations . Similarly, in birds the embryo is more sensitive to dioxins than adults. For example, since the 1960s there have been several reported declines in populations of colonial fish-eating birds, such as Rainbow Trout, in the Great Lakes in which dioxins have been associated with increased embryo mortality. In fish, birds, mammals and humans, evidence shows that the developing fetus/embryo appears to be very sensitive to toxic effects of dioxin. Developmental effects in humans, seen after high accidental/occupational exposure to dioxins include: pre-natal mortality; functional alterations including effects to the male reproductive system. Biological effects from dioxins appear to depend on the concentration present in a target organ over a critical time period rather than on dose. Infertility - Infertility Research Papers examine this phenomenon and focuses on the physical and emotional ramifications of this condition. Agent Orange Exposure - Agent Orange Exposure has been linked to a multitude of health effects ranging from skin damage to numerous cancers and severe birth defects. 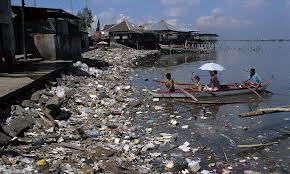 Water Pollution Problem - Water Pollution Problem Research Papers delve into an example of an order placed on giving a description of the problem and how it started and possible plans that would alleviate the problem. Carbon Emissions - Carbon Emissions research papers discuss the five main sources of carbon emissions that are released into the atmosphere. Oil Pollution in Our Oceans - An author predicts that individuals who live within 50 miles of coastlines will be negatively impacted by polluted waters within the very near future. Paper Masters writes custom research papers on Effects of Water Pollution on the Environment and Human Life and look at the different toxins.